Chism or Chum? Help! Who Is He? The above picture and envelope below it were found in Hattie Fenn Glover's Bible, which is in my possession. 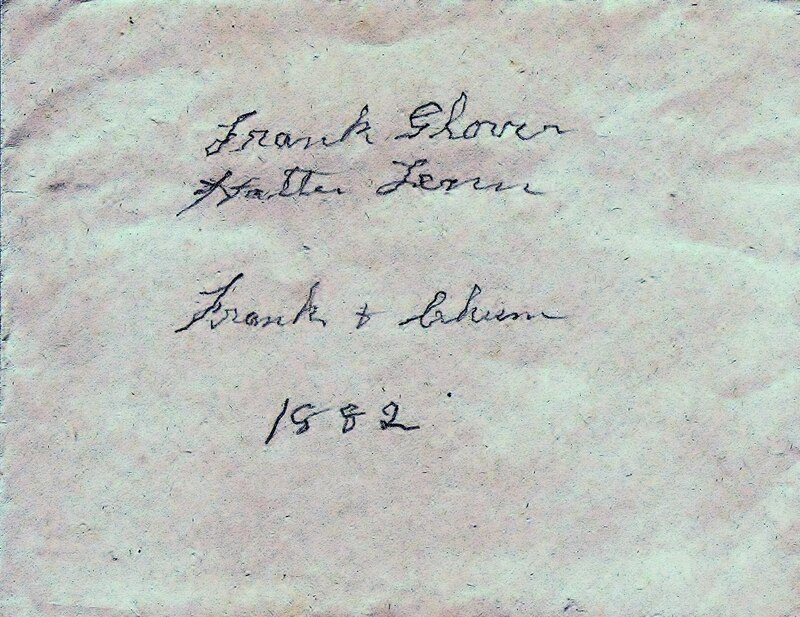 This picture and a picture of Frank H. Glover and Hattie Fenn on their wedding day were both in the envelope. So, who is Chism? or is it Chum? What do you think? 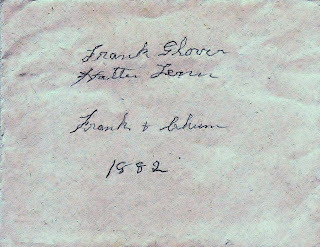 Frank H. Glover and Hattie Lodema Fenn were married on 12 May 1882 at the 1st Congregational Church in Jackson, Michigan. Their witnesses were Frederick Wheeler and Mary S. Karnick. Could Chism be a nickname for Frederick Wheeler? Who else would be important enough to have their picture taken with the groom? The other possibility might be a brother. Of course, I am just speculating at this point as I really don't know who it is. Frank H. Glover had three brothers that would be around his age; Charles, who was 23 at the time, William, age 21, and Louis, age 16. I believe most people know of Battle Creek's relationship with cereal, specifically Kellogg's, but there is a lot more to Battle Creek's history than cereal. The book includes historical photographs of people and places pertaining to Battle Creek, Michigan. The chapter, "They Left Their Mark" includes biographies of local Battle Creek citizens, including Erastus Hussey and Sojourner Truth and their connection to the Underground Railroad. In the Appendix section, the author lists other sources for reading about Battle Creek, Michigan. If you are researching ancestors in the Battle Creek, Michigan area, I encourage you to check this book out, who knows maybe you will find your ancestor. 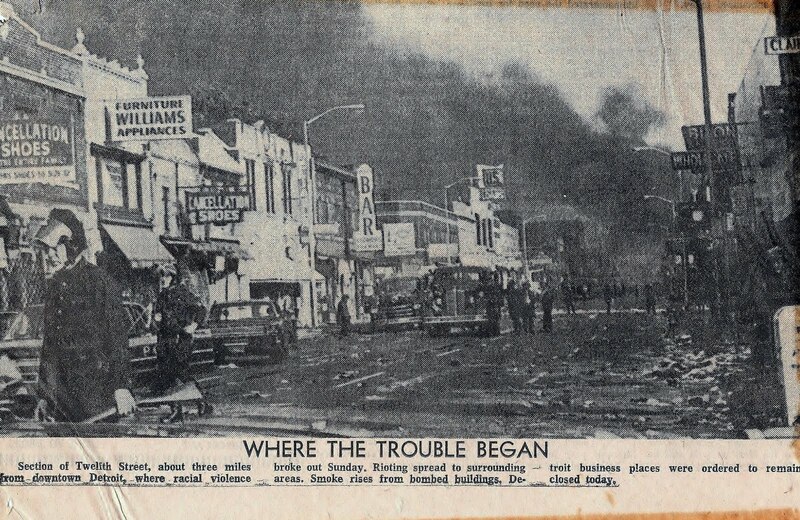 I am in the process of going through my childhood scrapbook, which is a mess, and came across pages of newspaper clippings about the Detroit Riots. 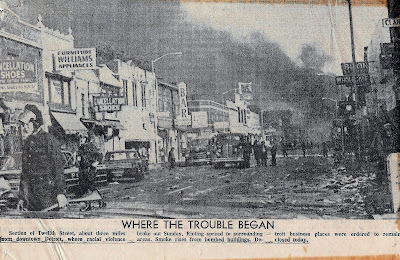 I was 9 years old on July 23, 1967, the day the riots began and I remember the newspapers, and television news, were full of reports on the riots. I don't know why I was so interested in this. I remember talking to my mother about it and I clipped lots of pictures and articles out of the Detroit papers. I was amazed at the pictures of people 'stealing' looting from stores. I thought that was horrible! I grew up about 100 miles north of Detroit. 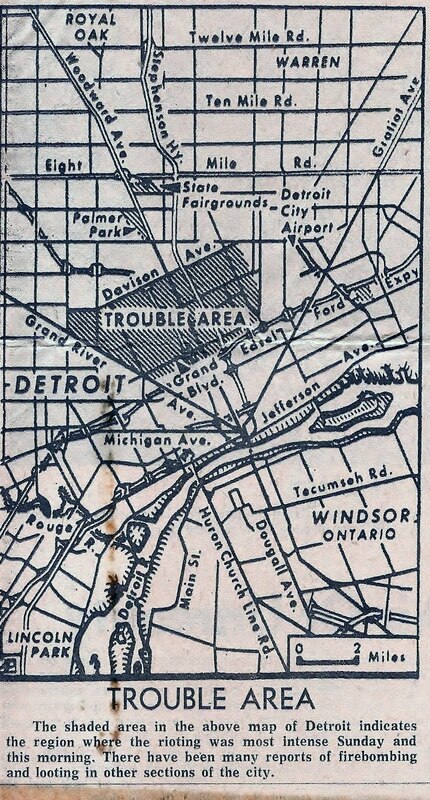 We would go to visit my Uncle Hank and Aunt Mabel, who lived in Ferndale, Michigan, a suburb of Detroit. My dad grew up in Hazel Park, Michigan and my grandmother lived there for awhile. We would go to the Detroit Zoo and to Tiger Stadium during the summer and sometimes go school shopping there. I guess because we had been there a few times, I was amazed at what was going on in Detroit that summer. 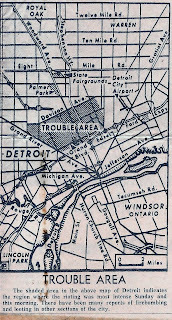 The Detroit Riots started July 23, 1967 and lasted four days until July 27th. Thirteen thousand troops, mostly National Guard, were called in to restore order. Six people were killed and 200 injured during the riots. The rioting started after a pre-dawn police raid on an illegal bar, which led to the arrest of 73 people. Adeline was the only daughter of Frank H. Glover and Hattie Fenn Glover. Adeline E. (Glover) McKie, 95, of Bradenton, Fla., and formerly of Battle Creek, died Monday, Aug. 16, 1993, in Bradenton. Mrs. McKie was born Feb. 17, 1898, in Bear Lake. She lived in Marquette moving to Battle Creek in the mid 1920's, back to Marquette in 1943 and to Florida in the late 1960's. She was a homemaker and a former member of Order of Easter Star, Daughters of the Nile and Jobs Daughters. She enjoyed traveling and playing cards. 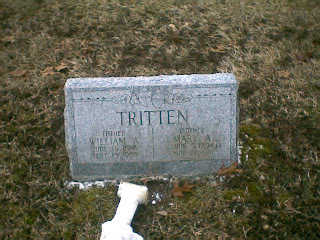 She was preceded in death by her husbands, Victor Tyson in 1944 and Leonard McKie in 1970; and three brothers. Surviving are sons, Jack G. Tyson of Battle Creek, James V. Tyson of Bradenton, and Francis "Ted" Tyson of Montclair, Calif.; six grandchildren; and 10 great-grandchildren. Services: 11 a.m. today in Memorial Park Cemetery with the Rev. Delmer Case officiating. Was Vinera Eglantine Glover Born on This Day in 1802? Do you have ancestors whom you have mostly secondary sources for? I do, and Vinera Glover is one of them. She was the mother of 12 children, the last two being twins-Henry and Polly. They were born 15 January 1847. One died on 24 January 1847 and the other 31 January 1847. I can't help but think that their birth and/or death contributed to Vinera's death at the age of 44. Apple from Apple's Tree blog, has done a wonderful job of transcribing church records from the Phelps Citizen newspaper and Vinera Glover was admitted to the church at Oaks Corners on 23 March 1820. I have a ways to go in my research of Vinera Glover, but I wonder why I am not satisfied unless I find primary sources? I plan to continue digging and trying to verify her maiden name. I believe it to be Powers. Plus, I wonder if her middle name doesn't provide a clue of some sort. I find the early to mid 1800's to be my toughest challenge in researching people. The census doesn't list names other than the head of household and Michigan didn't record deaths until later. Do you have any tips for researching this time period? If so, please leave a comment. And, if you are related to Vinera Glover, I would love to hear from you. So, just in case today was your birthday, Happy Birthday, Great, Great, Great Grandma Glover. Week 29: Water. Do you have any memories of the sea or another body of water? Did you live there or just visit? What did you do there? You can also describe a body of water by which you live or visit in the present day. During most of my childhood I lived within easy access to a Great Lake. The Great Lakes of Huron, Michigan, Superior and Erie border Michigan. I have lived on Lake Huron(Harbor Beach) and Lake Michigan(Harbor Springs). It wasn't until I had to drive an hour to get to one of the lakes, that I realized I had taken living on the lake for granted. Sandy beaches usually go along with most of the Great Lakes. Harbor Beach was no exception. The public beach, at the end of Trescott Street, in Harbor Beach was a popular summer hangout. There was lots of sand for all to enjoy. A group of friends and I would hop on our bikes and head to the beach. We would read, swim, sun bathe, look at boys and jump off the pier. The swimming area here was protected by a break wall, so no rough waves to worry about. I remember having a red, white and blue two piece bathing suit, and then in high school a green string bikini. Oh, what I would give to fit into that now! In addition to the sandy waterfront, Harbor Beach had a pier you could walk out on. In the summer time staff was available to provide services to the boaters who docked there. It was fun to walk out and see the various boats. Those services are no longer available at the public beach, but the pier has been restored and can be walked on. Harbor Beach has a lighthouse to enjoy also. It is about a mile from shore, on the break wall. In fact, this summer, tours of the newly restored lighthouse are available. It is on my list of things to do this summer. It was never open during my time in Harbor Beach. If you are looking for a great time, come visit one of our Great Lakes. My aunt, Lola Fredricks Brown, a great cook. Boil raisins in water 10 minutes. Remove from heat and add shortening. Let stand while you mix all dry ingredients together. Add to raisins and beat. Add beaten eggs and beat again. Pour into a greased and floured pan. Bake at 375 degrees for 30 to 35 minutes. This is transcribed as written. The pan size is a 9x13" pan. Enjoy!! Aunt Lola, my mom's sister, is 91 years old this year. I remember visiting my aunt when she lived in an apple orchard. Her husband, Uncle Walter, was the superintendent of the orchard and their house was on a hill overlooking acres of apple trees. There were apple trees on all four sides of their house. I thought it was the neatest thing. We had a few dinners at her house and they were delicious-think home cooked, fresh food. For years, Aunt Lola was the one to bring spaghetti to the family reunion. I don't remember there ever being any left. In addition to being a great cook, Aunt Lola has a superior memory. She is the one I go to if I have any family history questions. Thank you, Aunt Lola. Most of my ancestors occupations were farm related. So when I came across my great grandfather's occupation I was intrigued. Frank H. Glover, my great grandfather, listed his occupation as brakeman for the Illinois Railroad in the 1910 U. S. Federal Census. He also listed his occupation as brakeman on his 1882 marriage record. A brakeman was one of the most dangerous positions in the railway. The brakeman duties were to assist the conductor, operate the brakes, and assist with switches. Prior to 1872, the brakeman was the one who had to walk on the top of the moving train to apply the brakes and make sure all cars were stopped. At this time, there were two brakeman who worked from the front and back of the train. In addition, the brakeman was responsible for track switches, coupling and uncoupling the cars. In 1872, a system for air brakes was designed. The need for walking on top of the train to set the brakes was no longer needed. The brakeman was responsible for hand setting the cars in the yard though. After this, only one brakeman was needed. In 1893, it was mandatory that all train cars have air brakes and automatic couplers. The brakeman was the one responsible for operating the brakes. I don't know if my great grandfather ever walked on top of a moving train, but I would have loved to hear his stories as a brakeman. I imagine he saw a lot of changes during his time working for the railroad. Do you have an unusual occupations that your ancestor did? Please share in the comments section. Before I ordered the pension file for my great great grandfather, Samuel Stillman Glover, Jr., I had researched his marriage. I found a record for Stillman S. Glover and Ada L. Dyer, who were married Aug 2d, 1857 in Adrian, Michigan. I was pretty sure I had the right couple, but you never know as the names weren't exactly right. 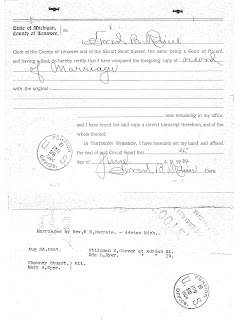 Included in Samuel's pension file was the documentation for his marriage, below. The top half of this copy is from the County Clerk for Lenawee County in Michigan. 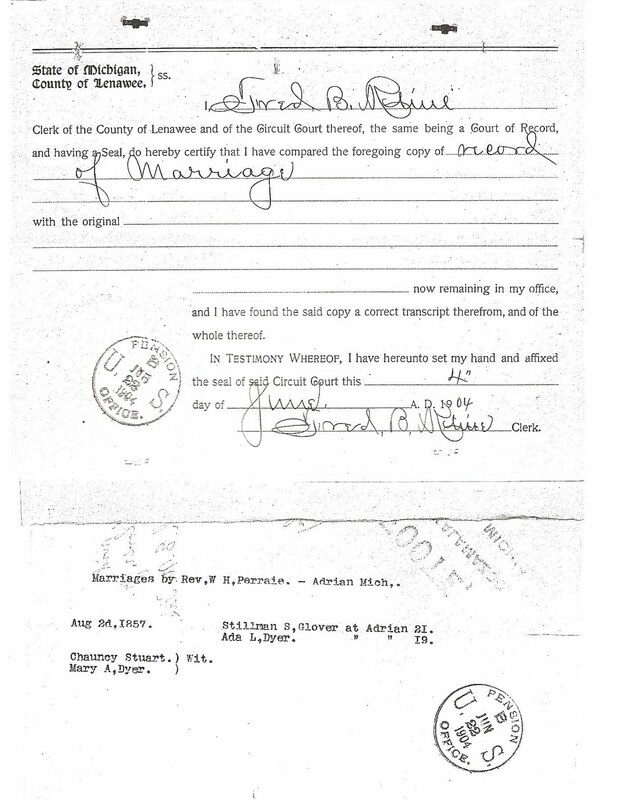 He certified that he compared the copy of record of marriage (bottom half above) with the original in his office and found it to be correct. 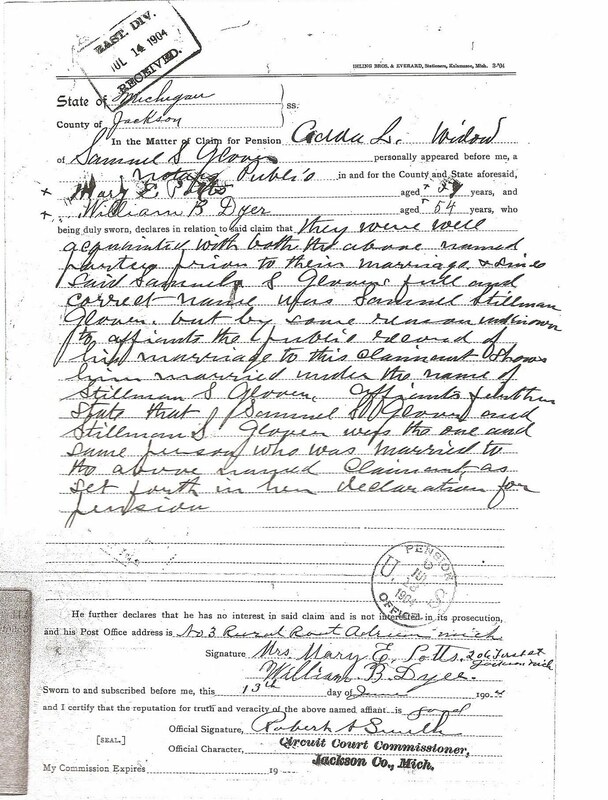 It shows that Stillman S. Glover and Ada L. Dyer were married at Adrian, Michigan by Rev. W. H. Perraie on Aug 2d, 1857. Witnesses were Chauncy Stuart and Mary A. Dyer. The other evidence was in the form of a document sworn by Mary E. Potts and William B. Dyer. Mary and William are Adeline Dyer Glover's sister and brother. 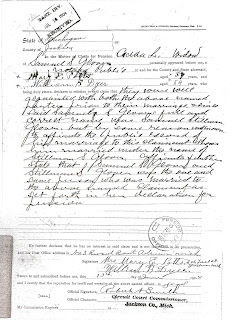 They state that "they were well acquainted with both the above named parties prior to their marriage and since said Samuel S. Glovers full and correct name was Samuel Stillman Glover, but by some reason unknown to affiants the public record of his marriage to this claimant shows him married under the name of Stillman S. Glover. 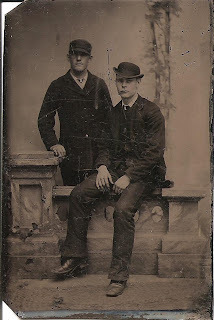 Affiants further state that Samuel S. Glover and Stillman S. Glover were the one and same person who was married to the above name claimant as set forth in her declaration for pension." So, Stillman S. Glover is Samuel Stillman Glover, Jr. I am guessing he use to go by Stillman as not to confuse him with his father or his brother, who was named Samuel Worcester. Summer: What was summer like where and when you grew up? Describe not only the climate, but how the season influenced your activities, food choices, etc. I have spent my whole life living in Michigan. Michigan's four season climate is wonderful. Summer weather can be cool, rainy, hot, or humid. We get it all, except for snow! We get enough of that during the winter. As a child I don't remember too many really hot days. The normal temperature for Michigan in the summer is in the 80's. I love it when we get 70 degree days. My family usually headed to the beach on Lake Huron when it was hot. It could be hot in town, but when you hit the hill toward the lake a nice cool breeze hit you. Time at the beach was spent sun bathing, floating, or swimming. One of the neat things my sister, Linda, and I would do would be to find this cool rock in the lake. It had steps on it. Some years the water level was too high and we couldn't find it. 1st Place Swimming-Holding my breath underwater the longest! I remember being busy in the summer after we moved to Harbor Beach. Harbor Beach offered summer recreation classes and I took a few of those. During the summer of 1968, I took swimming, archery and tennis. Swimming took place in Lake Huron. The water could be pretty cool during some of those morning classes. Classes weren't cancelled, though. I remember swimming in rain one morning. Archery and Tennis were held kitty-corner from our house at the old school playground. I just jumped across the creek and I was there. When I think of summertime food I think of locally grown fruits and vegetables. There is nothing like butter dripping from fresh corn on the cob, or the luscious taste of fresh tomatoes, sliced with a little salt. Sliced cucumbers in vinegar, or a sour cream dressing are delicious as well. Michigan is know for its' fruit crops, too. Strawberries, sweet and black cherries and blueberries are in abundance during the summer in Michigan. All of these fruits make delicious pies or desserts! I remember a trip home after going to the Fredricks family reunion one year. It was my mom, sister Linda and I. My mom had bought a lug of black cherries, one of my favorites. We were allowed to eat them on the way home. We spit the pits in a bucket. I thought I had died and gone to heaven. I still enjoy the various home grown fresh fruits and vegetables today. Now that I live in a city I have to visit the Farmer's Market. Blueberries are gotten at LeDuc's blueberry farm in Paw Paw, Michigan. Just this week I bought 25 pounds! I freeze them to have all winter long. Now, that my mouth is watering, I think I will go have a bowl of fresh Michigan blueberries. There is nothing better. One of my favorite things about families are the heirloom pieces that get passed down from grandmother to mother to daughter. My grandmothers, and my great grandmother in particular, have been wonderful about opening their jewelry boxes for me. While wearing vintage jewelry can seem daunting, it shouldn't be! Wearing heirloom pieces, whether they're ten or sixty years old, is a great way to honor your ancestry and your childhood memories...all while looking fabulous. Not sure you can do it? Need some suggestions? Here are my five favorite ways to wear vintage jewelry. Don't be afraid to wear your vintage jewelry with your newer pieces. A vintage tennis bracelet will look refreshing when paired with three or four others, or wear a tiny brooch in a cluster with two or three on your jacket. Or just wear anything solo! Pairing a chunky, vintage gold necklace with a button down and simple diamond stud earrings makes you instantly office chic. My Grandmother Audrey gave me a gorgeous Sara Coventry brooch and earring set that featured pretty silver leaves and a pearl center. When my best friend Ashlee called me, her matron of honor, in a panic a week before the wedding because she didn't have her "something borrowed," I knew it would be perfect! She pinned that pretty brooch onto the stem of her wedding bouquet and it looked beautiful. Sometimes heirloom pieces don't come to you in the best of shape. Don't let those pieces sit in the back of your closet! Fix them. Any local jewelry designer should be able to help you out. Take that pretty pearl-less bracelet in and have the pearls replaced or links shortened. I had two links taken out of a vintage bracelet so it would fit my petite wrist and the designer was able to make them into earrings for me. Now I have two pieces to enjoy! If your jewelry is broken beyond repair have it created into something else. I found a young Chicago designer, Alex Agudo, who was able to resurrect one of my Great Grandmother's Weiss Bracelets. Some pieces were missing links/broken/missing stones, so Alex took the bracelet apart and restrung it using the good crystal pieces and some new black agate stones and then created a matching pendant necklace with the leftover piece. See the photo above to see the stunning necklace and earrings. Just because a piece was designed to be worn one way doesn't mean you can't do something else with it. Pin that brooch into your hair for a sparkling hairpin, or onto a hat for extra sparkle. You can even wrap some floral wire around the pin back and use it to decorate your flower bouquets. Have larger than life button earrings? Use them as mini brooches. Wrap a necklace around your wrist a couple times with some ribbon for a new bracelet. I have my Great Grandmother's engagement ring sans the diamond (Mom got that one!) that I intend to have a bright, colored gem set in to wear as a cocktail ring. Just think outside of the box a little and the possibilities are endless. Do you have a special vintage piece you like to wear? Kirsten is the daughter of Brenda, a Chicago area Singer and part-time Social Media Coordinator who just so happens to love accessorizing. William A. Tritten was the son of Henry Tritten and Lena Schrader. 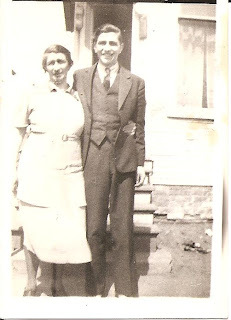 William A. and Mary Ann were married 19 March 1913 in Brethren, Manistee, Michigan. Week 27: Where did your family go on vacation? Did you have a favorite place? Is it still there? If not, has the area changed? It seems that most of the vacations my family took when I was a child had to do with visiting relatives. We would go to the Fredrick's family reunion in July or to Detroit to visit my dad's brother, Uncle Hank and Aunt Mabel. The Detroit visit usually included a trip to the Detroit Zoo, which is always a favorite, except for the time I lost my contact lens in the reptile house. I wasn't hanging around to find it as I never liked going into that part of the zoo. One summer, my parents decided to take a vacation to Canada. We lived on the Michigan side of Lake Huron. We were going to the Canadian side of it. My dad, mom, sister Linda, and I headed to Port Huron, Michigan and crossed the Blue Water Bridge to Sarnia. I remember being in awe of the bridge and thinking that I was going to another country. I have crossed it many times since, including once for my honeymoon. It is still pretty cool, to me. Our first stop was Collingwood, Ontario. My parents had rented a cottage across the street from the lake. I remember the first time I went swimming. It was so different from what I was use to. I was use to a few rocks and then a sandy, sometimes mucky, bottom. This was pure flat stone bottom. I remember walking out and falling off the cliff of it. Good thing I could swim. My mom was less than thrilled with the cottage so we only stayed there a couple of days, but boy do I wish I knew back then what I know now about my family history. My dad's grandmother, Katherine McGee Watt was born in Collingwood! What a small world! I am not sure my seven year old self would have appreciated it at the time, but I think back and say "if only". I asked my dad, after I discovered her birthplace, if he knew that her family was from the Collingwood area. He said, no. He said he chose the place because of it's location and he had wanted to go somewhere on the lake in Canada. After we left Collingwood, we headed to Owen Sound, Ontario and stayed a few days there. There was an inland lake there . It had a cool slide in the water. We went to a movie, went putt putt golfing and did a few other vacation type things.